The first time I saw Captain Atom, I might have swooned. He had great legs and a flair for dressing. He was a super-dandy. When he went critical, his hair turned a silvery-white blond. He wore candy-apple red tights and royal-blue boots that reached midcalf. His chest was marked with a bright-yellow circle containing an atomic symbol radiating action lines in every direction. Under his skin he wore a suit of liquid metal, which according to the comic books protected those around him from his toxic super-body that radiated radiation. The suit was a gift from President Eisenhower. 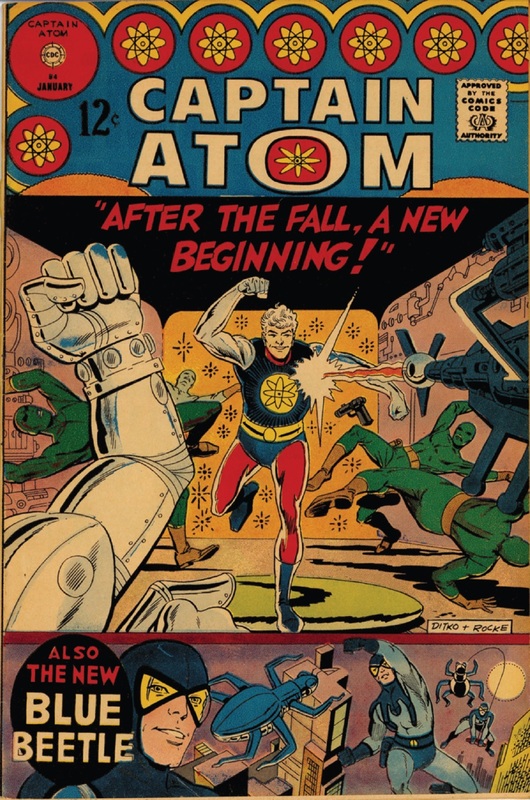 Captain Atom was an example of the new humanity that peopled the atomic sensorium created in the wake of Hiroshima. He was a successor to Max Weber’s vision of early twentieth-century folks enclosed in their iron cages and steel casings. In The Protestant Ethic and the Spirit of Capitalism, Weber, with a melancholic tone, notes that the material world of commodities and irrational rationalism had wrapped around people with a tightness previously unknown. It had changed them. The new casings, fabricated since the summer of 1945, were not like the iron traps or steel skins that Weber imagined; they were now inside us, no longer an outside layer but another layer before the muscle and the fat, liquid metal, fast like mercury, powerful and toxic, and nearly impossible to shed. When Weber was writing at the turn of the twentieth century, it was already too late to toss the cloak of the material world off our shoulders with ease. By Captain Atom’s time, we had entered a new sensorium. The cloak was now irradiated, and we absorbed it into us; no longer something light or heavy that lies upon us, the cloak is us. Captain Atom’s suit is yet another example of how the atomic—fantastically, terribly—re-enchanted the world.